During 1500 - 1600 many churches of the diocese were established: 7 churches (in Bassein), 20 churches (in Salsette), 3 churches (in Bombay) and 2 churches (in Karanja and Chaul). Among the Fathers of this period, two names stand out: Fr Antonio do Porto (Franciscan) who built churches in Bassein, Salsette, Karanja and Chaul, and Fr Manoel Gomes (Jesuit) who was known as the "Apostle of Salsette." The year 1637 marks the establishment of the Sacred Congregation for the Propogation of the Faith by Pope Gregory XV, under which the Church work energies of various Religious Congregations of nationalities other than Portugal and Spain could be harnessed for evangelization in those parts of the world where Portuguese (in the East) and Spanish (in the West) Fathers were, for one reason or another, unable to reach. From 1622, different Congregations were enlisted and sent to India, Malacca, Siam, China, etc. under the leadership of Vicars-Apostolic, i.e. Titular Bishops who received directly from the Holy See jurisdiction to work in certain regions assigned to them within the somewhat indeterminate boundaries of existing "Padroado" dioceses. The Vicariate Apostolic of Bijapur was established by the Sacred Congregation for the Propagation of the Faith (hence forth, "Propaganda") in 1637. The Vicariate of Bijapur increased rapidly in size, absorbing Golconda, and extended from the Arabian Sea to the Bay of Bengal, from Madras-Mylapore to Calcutta. It finally came to comprise the whole of the Moghul Empire at least on paper; hence it was also referred to as the Vicariate of the Great Moghul. From the end of the 17th century, this Vicariate was served by the Carmelite Fathers, whose head quarter was at Surat, north of Bombay. It was probably in 1692 that the Jesuit care-taker of the Parel property was expelled from Bombay. That ended the Jesuit presence on the island - till 1848 - a full one and a half centuries later. The Decree expelling the Portuguese Franciscans from the Bombay Island was issued on May 24, 1720. On the other hand they did not want to openly break the solemn promise they had made when they took over Bombay from the Portuguese: namely that they would not interfere with the religious beliefs or practices of the Catholic inhabitants of the island. So the British approached the Vicar-Apostolic of the Great Moghul, the Italian Carmelite Bishop Fra Mauritius, to take charge of the Catholic Community in Bombay. Since the British were determined on getting rid of the Portuguese Franciscans, Rome approved the entry of the Carmelites into Bombay. Thus the Franciscans left Bombay and Bishop Mauritius with four or five Carmelites came to Bombay. The churches taken over by the Carmelites were four in number: Our Lady of Hope (Esperanca), Our Lady of Salvation ( Salvacao), Our Lady of Glory ( Gloria) and St Michaels. In 1828, civil war broke out in Portugal between King Dom Miguel and the party of Queen Maria da Gloria. Dom Miguel, to whom the Religious Orders lent moral and financial support, was defeated, and the new government not only suppressed all Religious Orders in Portugal but also broke off diplomatic relations with the Holy See in 1833. Pope Gregory XVI issued the Brief `Multa Praeclare', on April 24, 1838, in which he confirmed the Vicars-Apostolic in their office, extended their field of work and deprived the Padroado clergy of all jurisdiction within the established Vicariates. The authorities in Goa rejected the Papal Brief: though Portugal had broken off diplomatic relations with Rome, they claimed that since the Brief had not received the ``regium placet'', it was null and void. Archbishop Dom Jose Maria da Silva Torres landed in Bombay on his way to Goa in January 1844. The Padroado party, clergy and laity, escorted him to Gloria Church in a triumphant procession. In Gloria Church and in other parishes, Archbishop Torres administered the sacraments, began a series of visitations and generally acted as if ``Multa Praeclare'' and The Salsette Decree had never been written. The Archbishop's behaviour threw the whole of Bombay into a ferment. When Bishop Hartmann came to Bombay in 1850, the one Catholic newspaper for those under the Vicar-Aposltolic's Jurisdiction was the Bombay Catholic Layman, run by two Irish laymen, who used the paper to oppose the first Bishop Whelan and then Bishop Hartmann. Rather than cross swords with them, Bishop Hartmann encouraged the starting of the Bombay Catholic Standard, under the editorship of another Irishman. Soon, disappointed with that paper as well, the Bishop approached a certain Mr Borges, a son of the soil, who in July 1850 had, on his own initiative, started a monthly publication, The Examiner. Three months later in September 1850, with Mr Borges' consent The Examiner became the ecclesiastical organ of the Vicariate under the Bishop's control and management, but another title, The Bombay Catholic Examiner. By 1852, the other two publications folded up while The Bombay Catholic Examiner kept on going. In April 1905, its title was shortened once again to The Examiner. Hardly had Bishop Hartmann come from Patna to Bombay than he found himself in the middle of the bitter Padroado-Propaganda conflict. 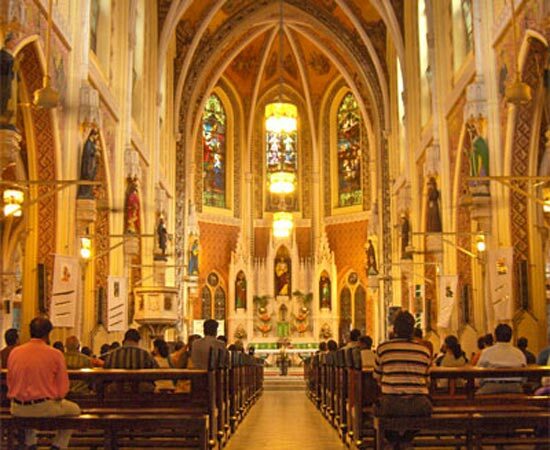 The Vicar of the Church set into motion a series of events which ended in June 1851 with Salvacao Church transferring itself to the jurisdiction of the Archbishop of Goa. Then came the Bishop of Macao, Jeronimo da Matta in February 1853, on his way to Goa. He stopped at Bombay and officiated in the churches of Gloria and Cavel, then he passed on to Salsette where he said Mass and conferred the sacraments at Kurla, Thane and Bandra. Sharing in the rebellious conduct of the Bishop were four Bombay priests: Antonio Mariano Soares (Vicar Genreal of the North and Vicar of Gloria Church), Braz Fernandes (Vicar of Salvacao Church), Joseph de Mello and Gabriel de Silva (Vicar and Assistant respectively of St Michael's Church). The Papal Brief of May 9, 1853, Probe Nostis, completely vindicated the rights of Bishop Hartmann and confirmed his claim to the exclusive exercise of jurisdiction in the islands of Bombay and Salsette. It also condemned unreservedly the behaviour of Bishop da Matta and the four Bombay priests. In point of fact, however, his jurisdiction continued to be ignored by the adherents of Padroado: witness the series of events at St Michael's Church in 1853 which culminated with the transfer of that parish together with the Sion chapel to the jurisdiction of the Archbishop of Goa in June 1854. The year 1853 is also noteworthy in that it marks the success of Bishop Hartmann's efforts towards founding a Catholic College in the Vicariate. Aware of what he called "the complete want of educational institutions for youth'', he first invited in 1850, the Sisters of Jesus and Mary to take over the education of girls in Bombay. This was the very first Religious Congregation for Women to really begin work in the Vicariate. Bishop Hartmann then turned his attention to a College which he considered would be the foundation stone of the social, intellectual and moral renewal of the Bombay Catholic Community. He laboured heart and soul to bring the Jesuits to Bombay for this purpose; his labours were rewarded when, by the end of 1853, there were four Jesuits in the Vicariate of Bombay (among them Fr Walter Steins and Fr James Peniston). On December 12, 1853 the Carmelite General informed Propaganda that the Carmelite Fathers had decided to give up the administration of the Bombay Mission. The Holy See accepted their resignation and thus ended, after a period of 133 years (1720-1853), the Carmelite administration of the Vicariate of Bombay. On February 16, 1854 Propaganda officially divided the Bombay Vicariate into the northern Vicariate of Bombay (comprising the islands of Bombay and Colaba, and Aurangabad, Khandesh, Malwa, Gujrat and Sind as far as Cabul and the Punjab) and the southern Vicariate of Poona ( comprising the islands of Salsette and Bassein, and the regions of the Konkan and Deccan or Bijapur). Further Propaganda entrusted the Bombay Vicariate to the Capuchin Fathers and the Poona Vicariate to the Jesuit Fathers. Bishop Hartmann was appointed Vicar-Apostolic of Bombay and Administrator of Poona. On August 13, 1857 Propaganda reversed the 1854 arrangement: the Bombay Vicariate was now given to the Jesuits and the Poona Vicariate to the Capuchins. When squabbles arose between the Jesuits and the Capuchins over the comparatively small financial resources of the erstwhile Vicariate of Bombay, the Superior General of the Capuchin Order decided to clear the foul air by completely withdrawing the Capuchin Fathers from the Bombay and Poona Missions. Thus on August 13, 1858 the Bombay-Poona Vicariate came entirely into the hands of the Society of Jesus.